At only $16m this is priced to sell. Rolling usable property boasts breathtaking ocean views of the Gulf of Nicoya, Tarcoles River Valley and Carara National Park. Bordering two nationally protected natural wildlife migratory corridors, resulting in rare close up viewing of many species. Most notably the famous wild Scarlet Macaws of Carara are frequent visitors here. More than 20 exotic varietes of fruit trees plus manyflowering ornamentals grace the property. Friendly International Community coordinates for common area projects such as road maintenance and other improvements. Voluntary monthly donations provide security and peace of mind with all night 7 days a week entry guard. 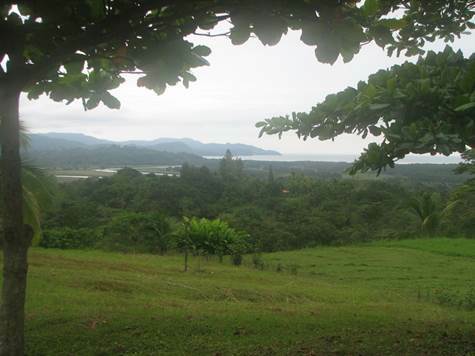 Only 1 hr to San Jose airport, 45 minutes to popular beaches and world class golf and fishing. Fast growing city of Orotina only 30 minutes. Very few properties remain available in this special community, and none like this one! Build your dream home, create a family compound, start an eco tourist project.